Tutorials and sample workflows for complicated, feature-rich software packages are widely available online. As a result users must differentiate and choose the most suitable workflow for their task. We present Delta, an interactive workflow visualization and comparison tool that helps users identify the tradeoffs between workflows. 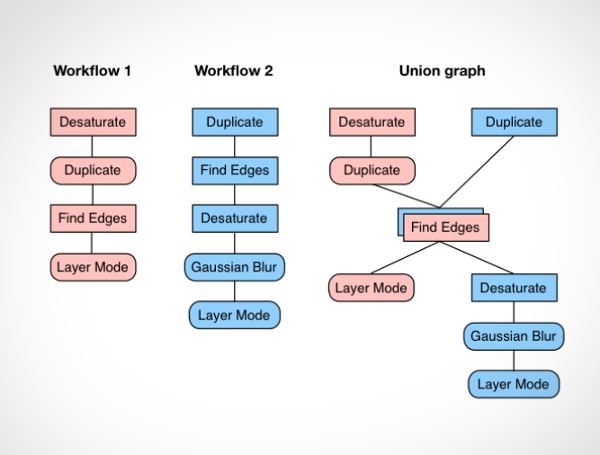 We conducted an initial study to identify the set of workflow attributes users consider when comparing workflows, finding that users consider result quality, their knowledge of commands, and the efficiency of the workflow. We then designed Delta to surface these attributes at three granularities: a high-level, clustered view; an intermediate-level list view that contains workflow summaries; and a low-level detail view that allows users to compare two individual workflows. Finally, we conducted an evaluation of Delta on a small corpus of 30 workflows and found that the intermediate list view provided the best information density. We conclude with thoughts on how such a workflow comparison system could be scaled up to larger corpora in the future.